WALKING is a dangerous business. Bulgarian dissident Georgi Markov has just been stabbed while walking over Waterloo Bridge. And get this: his assailant used an umbrella with a poisoned tip. We down another round of pints in the Brotherswater Inn and discuss the ramifications of the incident. I’m considered to be an expert in this field because I once witnessed two men fighting with brollies on a pavement in Ulverston. It was an ugly skirmish. Both brollies were seriously damaged. And now we’ve got to climb a mountain in the dark. Aren’t there enough dangers in the world without people wielding deadly umbrellas? Best have another pint first . 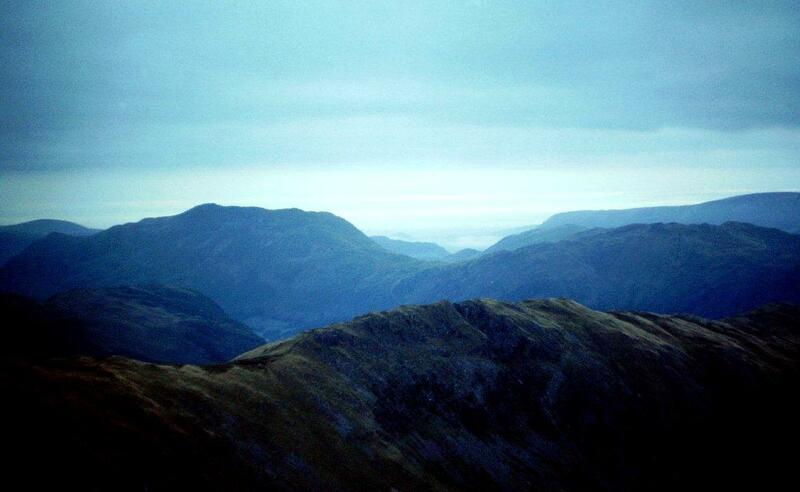 . .
Dove Crag is a mountain at the southern extremity of Patterdale, in the heart of the Lake District. It’s not famous for much at all – but in the centre of its sheer north-eastern cliff is a cave a few metres deep, often used as a bivouac by adventurous walkers. 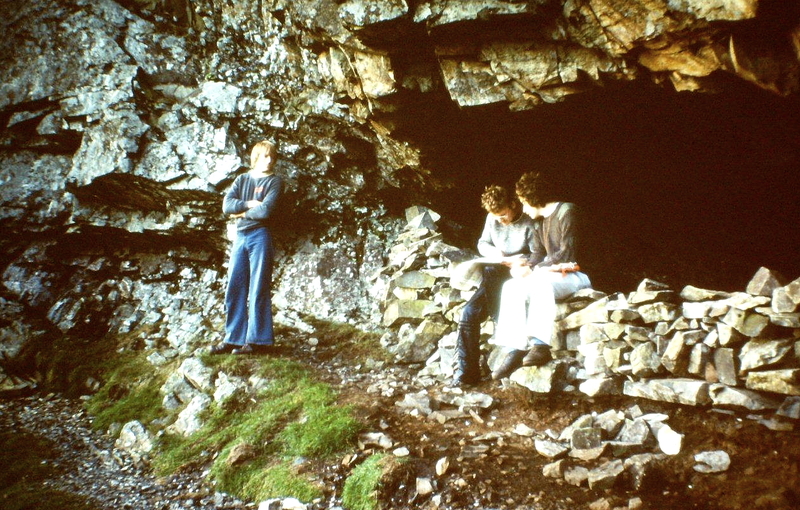 My mate, Francis, reckons that in days gone by the cave was appropriated for the distilling of whisky. 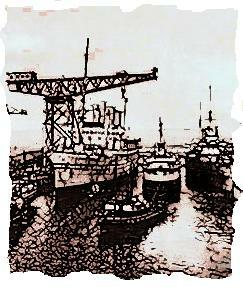 Lakeland certainly had a thriving and illicit whisky industry, as well as being at the centre of the slave trade and its associated rum-smuggling interests (slaves out from Whitehaven, rum back on the return trip), but whether or not Dove Crag Cave played a role is a point up for discussion. The cave is pretty inaccessible. Not only that, it is visible from the valley below, and any activity would have been spotted by the authorities. That’s my opinion anyway. The four of us argue the toss as we stumble along the valley in the gathering shadows. Our intention is to spend the hours of darkness in the cave, rise early, and climb to the top of the crag to watch the sunrise. But we might come to blows first over this whisky distilling business. Good job no one has an umbrella. Hey. Also in the news: escaped Baader-Meinhof Gang member Astrid Proll has just been arrested in London. Could she be Georgi Markov’s killer, we wonder? We quarrel over where the extreme left Beider-Meinhof Gang and the Red Army Faction stand on the question of Bulgarian dissidents. She’s a contender. It’s obvious. Job sorted. 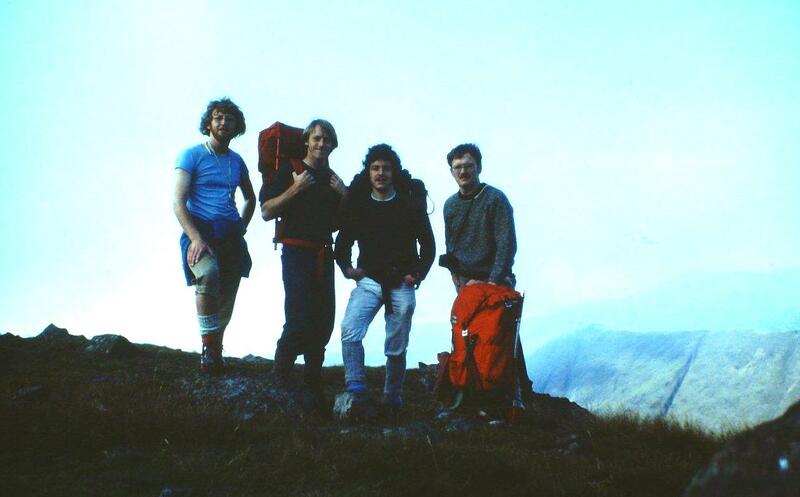 Darkness has fallen by the time we (Pete, Nige, Francis and myself) reach Dove Crag. Francis leads the way along narrow ledges to the mouth of the cave. I am conscious of a very large drop to my left. But we only had two or three pints in the Brotherswater Inn so we’re pretty steady. No one falls off. 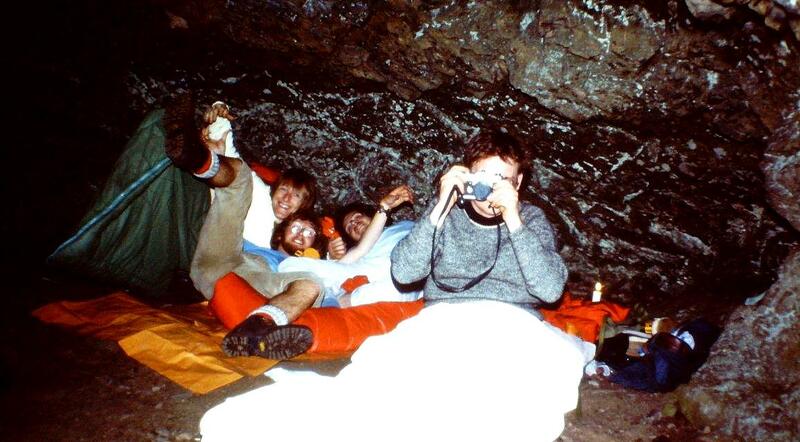 Once in the cave we take pictures of ourselves, and as young men do we pull faces and make silly gestures. But we’ve all been brought up respectfully by our mothers, and no one resorts to baring their backsides and vulgar stuff like that. It’s all good-natured fun of a type Beatrix Potter might not necessarily have approved but would certainly not have denounced. Just before sunrise the clouds roll in and envelop the mountains. 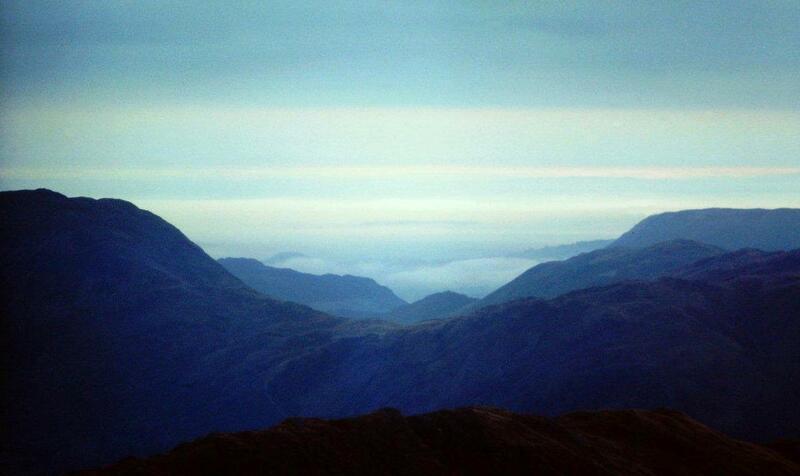 This is the traditional opening sequence of a Lakeland dawn, as most people who have climbed a mountain to observe the sunrise will testify. 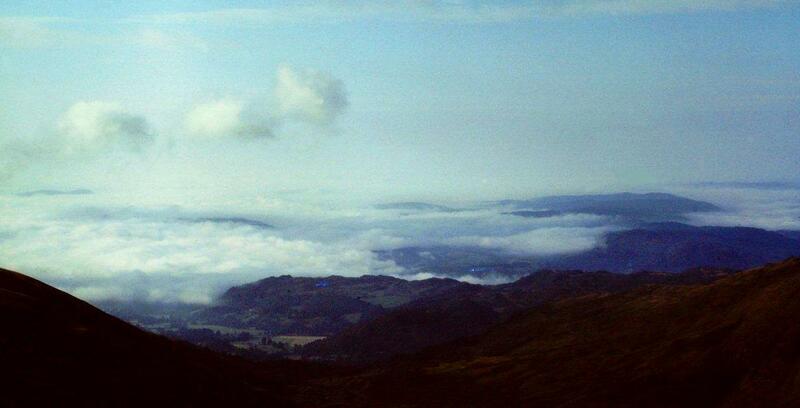 Nevertheless, we troop to the top of the fell (792m or 2,598ft) and watch the landscape take shape beneath our feet. 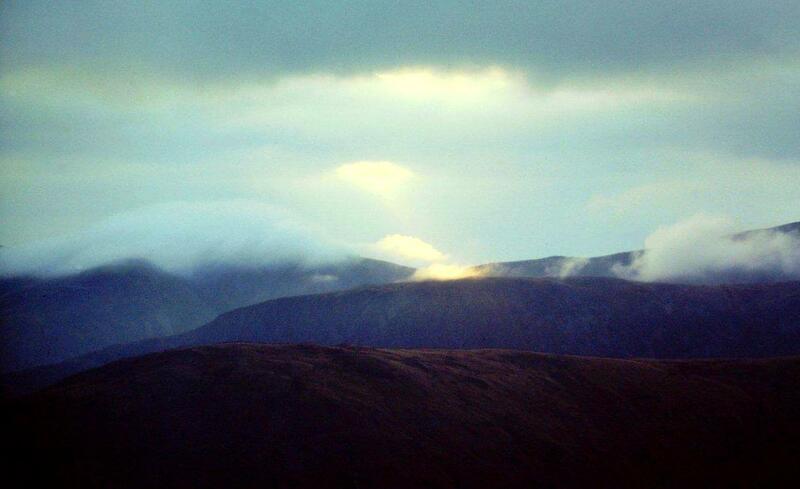 The sun obliges by casting the occasional beam of light through tiny holes in the clouds. This is quite effective. Then we nip back to the cave to pick up our gear, then drive home and go to bed. Astrid Proll had nothing to do with the Georgi Markov murder, it transpired. Apparently, although living under a new identity she was a very nice person, had spent some time as a youth worker and was teaching car mechanics at the time of her arrest. To this day, no one has faced justice for the notorious Waterloo Bridge poisoned umbrella murder. So if you want to bump off someone, you know what you need. 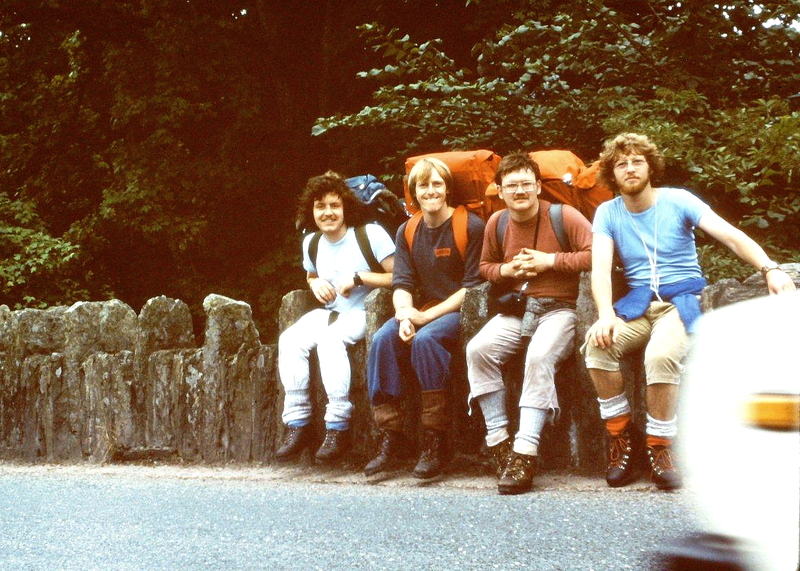 This entry was posted in Beer, Camping, Caving, Climbing, Hiking, History, Legends, Mountains, Traditions, Walking, Weather and tagged Cumbria, Lake District, outdoors, The Lakes. Bookmark the permalink. I’m glad you said which one was you in that last photo – because I couldn’t tell! Fun stuff, all very 70s looking…..
Hi Chrissie. I had a great time in the 70s. It’s a shame times have to change. Another great reminiscence. Many thanks for sharing it with us. Hiya Alastair. Good to hear from you. I’m sure I could find a few slides with you on somewhere that might stir some memories. Cosy story and pictures, Alen. The umbrella murder is an interesting story. I can tell you who did it 🙂 It was Piccadilly. That was his code name for Francesco Giullino and of course he was a Dane, albeit of Italian origin. The data was leaked from Bulgarian Secret service in 2005. Francesco Giullino is still alive and kicking in 2012, according to an interview with ZDF in Germany. They asked if it was he who had a passion for umbrellas. He found no reason to answer. Hi Hanna. That’s interesting stuff. I’ve just read his page on Wikipedia. I missed that story when it first came out. I shall have to buy the Times in future. The whole episode is a murky business from start to finish. I think what captured the imagination of people over here was that it was like something out of a James Bond novel. Suddenly, fiction had become reality, and these shadowy people were operating on the streets of our towns and cities. PS I’m sure not all Danes are so ruthless. No, it’s not that bad, Alen. Thankfully the rain wear is invented. 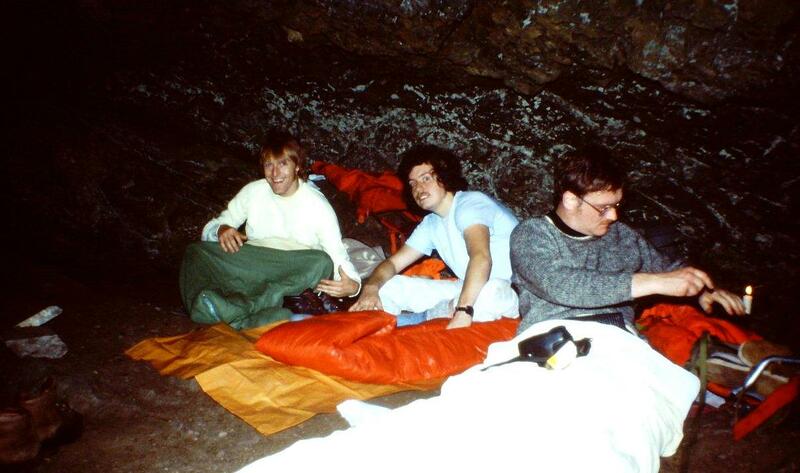 Hi Alen, thanks for the posting, I didn’t know about the cave at Dove Crag. The floor looked very level, looks like a great bivi spot! I’ll have to check it out. I remember the umbrella incident (albeit with the wrong date, I thought it was 1980 so thanks for sorting that out), I also recall seeing a program about it years later which said the poison used was ricin. Hi Mike. It was indeed ricin, in the form of a pellet. The lengths that some people will go to . . . The cave is flat and dry, and you will see from the outside shot that there is a low wall to prevent people rolling over the crag in their sleeping bags. It’s large enough to accommodate about a dozen people, if I remember correctly, and there is even a visitor’s book. 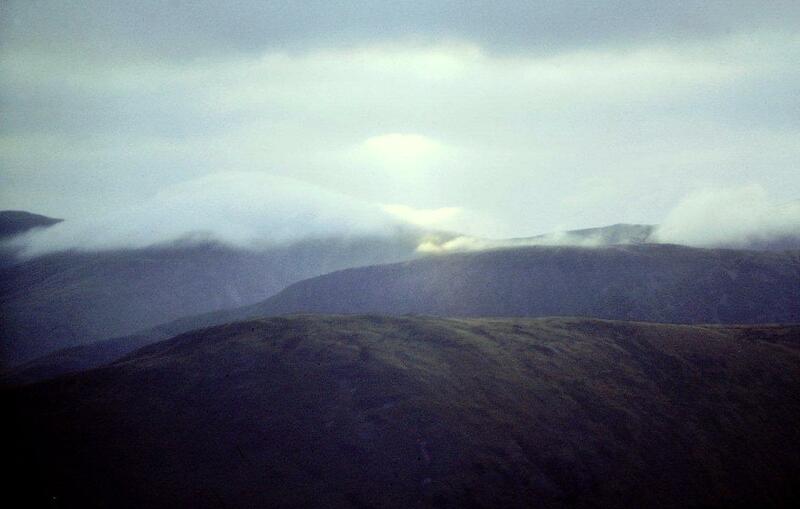 The route follows the main path up the fell until it is more or less level with the cave then cuts off almost horizontally to the left along grassy ledges. The cave is marked on the large-scale Ordnance Survey maps as “Priest’s Hole”. LOL to the 2 guys fighting with umbrellas in Ulverston – I’d have loved to have seen that! I’m jealous of you spending a night in the cave – I haven’t even visited yet – I’m plucking up courage for the route to it! Hi Carol. From what I remember the path to the cave across the crags is pretty straightforward. I’ve been meaning to go back for a long time, it’s just another thing on the list of things to do that never gets done. I wonder what it is about Waterloo Bridge that attracts the assassins? Wasn’t the guy from the Vatcian Bank hung underneath the bridge? 1978 . . . makes me turn into Ron Manager thinking about it: Holland losing the World Cup final, Motor Show at the NEC, jumpers for goal posts. I’ve often tried to see the cave from the valley. Probably looked straight at it without knowing it. Funny how your friend didn’t get blown off the ledge when the wind caught the flares on his trousers. Close, but not quite a bull’s eye there, Chris. Roberto Calvi was found hanging beneath Blackfriars Bridge in 1982. It was as big a story as the umbrella murder at the time. In fact, probably bigger because it involved the Vatican, mafia, and a shady organisation called P2 – which was an illegal branch of the Italian freemasons. Some bad blokes went on trial in Italy a few years ago but were acquitted. What intrigues me about these high-profile cases, all of which involve the political classes and security services of various countries, is that no one ever gets banged up. Roberto Calvi, Georgi Markov, Alexander Litvenenko (drank poisoned coffee in a London cafe), Gareth Williams (MI6 man found dead inside a holdall in his bath), the list goes on. Stacks of evidence but no successful prosecutions. Not that I’m insinuating anything, you understand. Had a laugh over Nigel’s flares. Mind you, I had a laugh when I found the slide too. So that’s two for the price of one. I’m glad you corrected that. I think I mentioned Calvi and Waterloo Bridge in a book I’m writing, so off to do a quick edit. Don’t go for the wrong bridge. Monty made that mistake. Hi Alen, true story this: many years ago, a former work colleague of mine was detained for several hours – initially without explanation – at Frankfurt airport. Eventually he was allowed to leave and told he had been held because he “bore a striking resemblance” to Andreas Baader. His protestations that he was “just a purchasing manager from Droitwich” cut no ice (he even showed them his company Barclaycard) and, to be fair, that’s just the kind of deep cover favoured by the red army faction. He did have dark hair and a ‘tache, but he was hardly a doppelgänger. Hi Dave. Great story. But a scary story, too, Just imagine what could happen nowadays when all airport police are armed and security has beeen stepped up everywhere.